Update: Royale Caribbean joins forces with Choice Hotel's Ascend Collection, their five-star division. 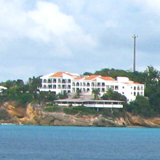 The pastel palace above first entered our line of vision on a drive through the Little Harbour area in 2002. We have been perpetually puzzled by the structure, until recently. Every time we passed by the project, it seemed further along. Yet we never heard anything about it. We couldn't even figure out how to get to it. Asking around about it was fruitless, unable to deduce much from mostly vague and unclear answers. Who was building it? What was it? When would it be open for business? What kind of business? 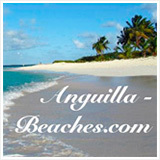 Anguilla tourism business? Condos? A hotel? Our questions would go unanswered for years. A few years ago a new highway cut through the land to George Hill to Blowing Point. The Jeremiah Gumbs Highway gave us our clearest view yet of this mysterious edifice. More importantly, it gave us an access road. Knowing "Discovery Dad," I don't have to tell you what happened when we found that road. A sharp turn off the highway! We expected weeds galore, blown in windows. A deserted, haunted hotel perhaps, laced with cobwebs Scooby-Doo style. What we actually found would make our heads spin. We drove up a well manicured driveway lined with sparkling conch shells, all the way to a freshly painted front gate security post closed shut. No one was in the booth. Our journey to the truth ended as quickly as the butterflies in our stomachs had started to flutter with excitement. The air was quiet, eerie almost. The property felt abandoned, yet it was in pristine condition. We, however, had hit another dead end. 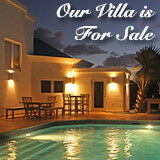 The owner was Dr. Bryan's uncle, Mr. Quincy Gumbs. Dr. Bryan kindly arranged a tour. On the appointed day, he led the way into Royale Caribbean, ready to introduce us to his uncle, the driving force behind an Anguilla tourism project of truly colossal proportions. 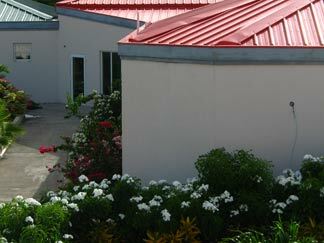 We had learned from Dr. Bryan that this would be the first facility dedicated to Anguilla conferences, trade shows and conventions. The lobby was magnificent. Standing there I peered into the future, seeing hundreds of convention-eers and people attending Anguilla trade shows. In a daze-like state I uttered, "There is just nothing like this in Anguilla." Dr. Bryan smiled and nodded, "It's true." 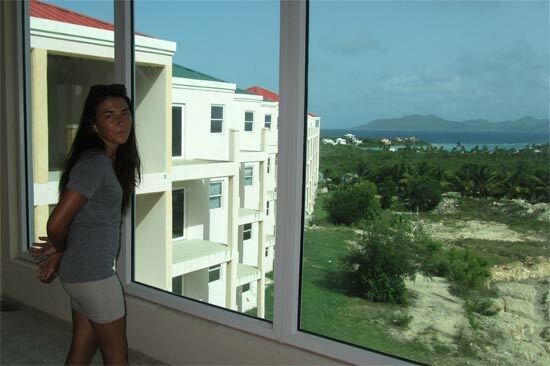 There really isn't any space of this size or splendor in Anguilla. 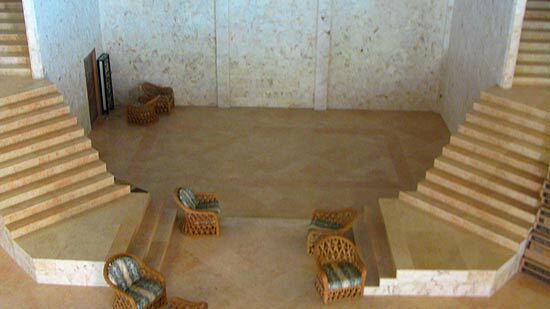 The lobby is expansive, encased in gentle pink Anguilla Native Stone. 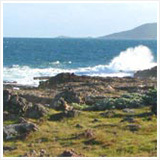 It emits a sense of sophistication and Caribbean calm. Clyde shouted out for his uncle. Echo. Echo. Echo! We heard a voice in the distance. Mr. Quincy Gumbs was standing in a room so immense Yao Ming would even shrink in his size 18 shoes! We caught him at the end of a long day's work, yet still obviously energized. Mr. Quincy Gumbs is an entrepreneur who thinks big! Before embarking on his new Anguilla tourism project, he owned the Fairplay Complex, leasing it to Scotia Bank and many local businesses. Mr. Gumbs provides great support for Anguilla, passionate about Anguillian success. 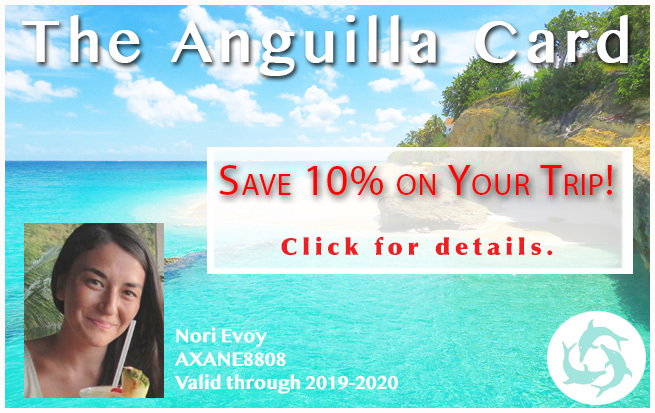 Anguilla is the island where it all began, the island that brought him great opportunity, and gave him the beginnings of his long and successful career. 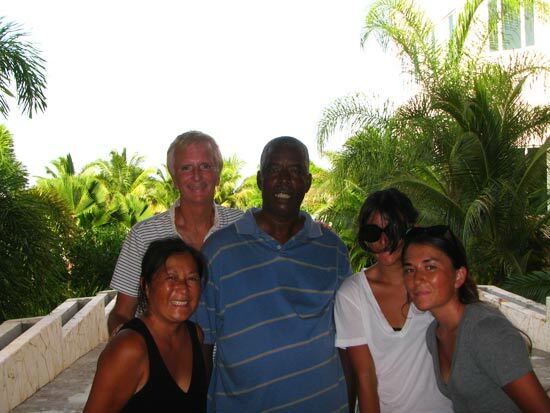 Now, he wants to bring convention tourism to Anguilla and conference travel to Anguilla. Approaching 10 years into this project, he continues to work tirelessly, going strong after having heart surgery just months before we met him! Nothing it seems can slow down Mr. Quincy Gumbs. 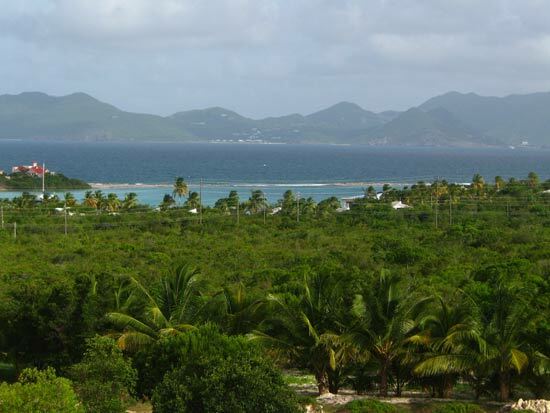 St. Martin in the distance, the Caribbean, the protected waters of Little Harbour and lush gardens approach you. 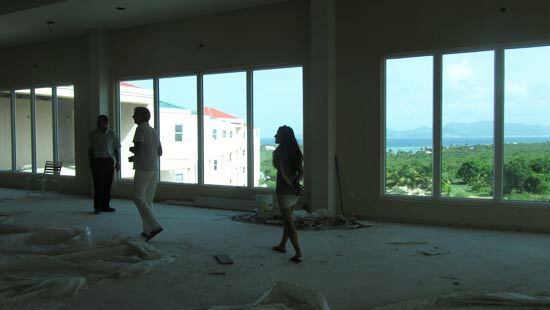 Mr. Gumbs explained that guests would soon be able to enjoy a third major body of water in this view. The biggest pool in Anguilla (soon to be finished) would soon join Little Harbour's quiet cove and the Caribbean sea before St. Martin's majestic mountains. As we explored, Mr. Gumbs explained the vision behind this Anguilla conference tourism project, a brand new market for Anguilla tourism. 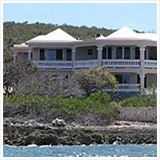 Well-versed in this area, with decades worth of conferences and with world-class consultants, it's clear that detailed thought and consideration have gone into the building of his Anguilla conference center. 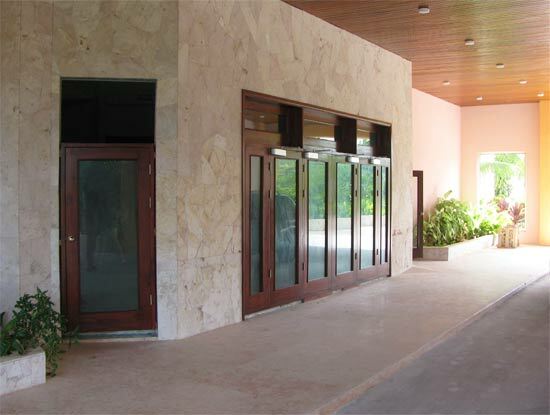 Royale Caribbean has been carefully crafted to suit the needs of conferences, conventions, meetings and trade shows in Anguilla. He incorporated that which other conference hotels have done right, corrected their faults, and added his own special insights. The project has been executed with utmost care and dedication. For example, the women's bathrooms were made extra-large for a reason. At conferences Mr. Gumbs always noticed that women were lined up outside the bathroom. The cost of larger bathrooms for women? Reasonable. Eliminating the discomfort of waiting for the bathroom? Priceless! 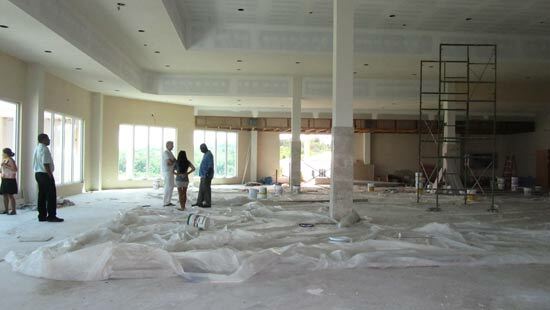 The project features 2 large conference rooms (up to 10,000 square feet each), 2 board rooms, 2 rooms for VIPs, and the reception area. The building can hold up to 1600 people for the conferences. The hotel itself has 80 rooms. Mr. Gumbs realizes that 80 rooms cannot accommodate 1600 people. 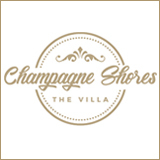 So this will be a great boon for all hotels on the island. 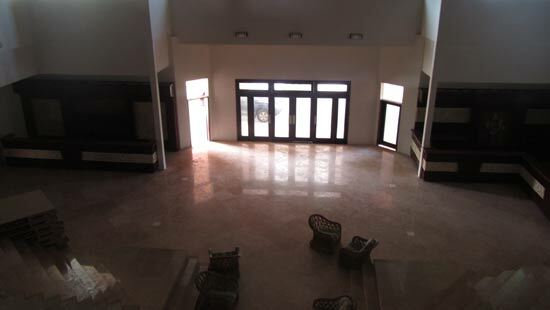 There are also 2 restaurants, multiple shops, and 1 spa (10,000 square feet). Mr. Gumbs told us about the spa with great enthusiasm. Naturally, you can attend the spa alone. Or you can turn it into a relaxing day with your family. Each spa room has a private plunge pool and can comfortably accommodate up to 5 people. A truly relaxing way to spend an afternoon, and still be with your family. After walking us through the main "hub," the central building with the conference rooms and restaurants, it was time to see the two wings that open out to the sea. We were off to see the hotel rooms. 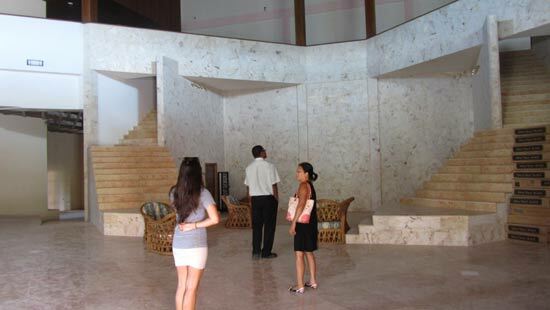 "What is the one big draw back to conference hotels," Mr. Gumbs asked us? "The hotel rooms!" he roared with pleasure. Generally, convention hotel rooms are shoe boxes with no view. After a long day of work, or when you wake up in the morning, or during a short afternoon nap, wouldn't it be nice to have a comfortable luxury room with a glorious tropical view? His crew is completing the finishing touches on the rooms. Last step? Choosing just the right furnishings. 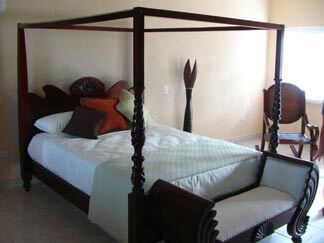 The Caribbean inspired decor was tasteful, but we were immediately struck by the generous size of each room. He could have crammed twice as many typical-sized rooms into each wing, my Dad said. Obviously, the guests' comfort comes first. 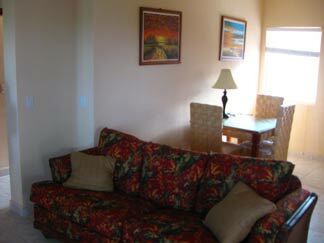 Some rooms open up into large one bedroom suites, with living space and kitchen. Every room has air conditioning. I'm not sure you would need it, though. We noticed how well the tradewinds moved through the hotel. Mr. Gumbs built Royale Caribbean carefully, considering every element, including wind. 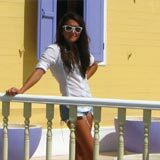 This resort captures the beautiful natural Anguillian breeze! So you have your choice. Enjoy the natural Caribbean breeze or turn on the air-conditioning, whichever your prefer, whenever you prefer it. Beyond the decor, the space, and the natural breeze, Royale Caribbean's rooms are staggered so that each room has an unobstructed view of the sea! Royale Caribbean has come a long way since its beginnings so long ago. The vision of one man, Mr. Gumbs worked diligently with a small dedicated team, each step planned and accounted for, no dollar or tile wasted. For instance, the landscaping started at the beginning of the project, not "installed" at the end, as an afterthought. 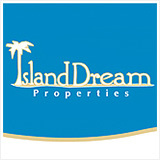 So the property is rich with mature Tamarind, palm and other trees, as well as lush gardens. That is smart planning that keeps costs down, but results high! Mr. Gumbs is "close... About 90 days away, close," he says. The pool is the last big step. The rest is just "details." 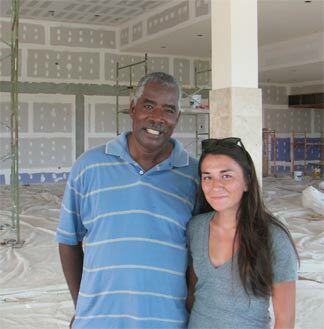 With Royale Caribbean nearing completion Anguilla tourism is in store for a change. Businesses around the island will benefit from Mr. Gumbs great ambitious nature. His facility is world-class, outfitted for prestigious conferences seeking a unique and exclusive setting. 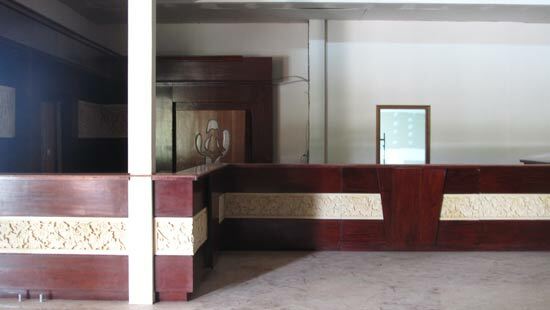 Businesses and other organizations are already making their bookings. 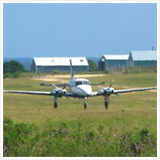 Since Anguilla is a high-end tourist destination, many senior executives make their way here. 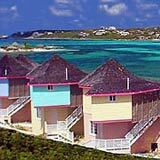 Some have already heard about Royale Caribbean through the grapevine. 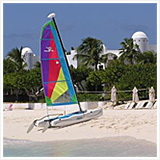 Royale Caribbean is simply in a league of its own, ready to introduce conventions and trade shows in Anguilla.